In conjunction with the AONB we are providing an Activity Day for staff and pupils from schools across the AONB. 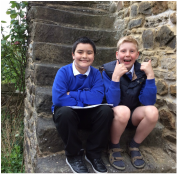 Based on the knowledge and skills gained from the Masham project above we are helping schools to discover their own local history - using sources and their local clues. Staff are also receiving Continuing Professional development in Local History as part of the day. We have also been supporting the twinned activity between Masham and Kell Bank Schools and 2 Leeds Schools as they explore the journey and stories of the Leeds Pals who trained on the moor above Masham. This is in conjunction with Leeds Museums. Working with local secondary pupils we will be investigating how the Great War impacted community health - both in terms of learning from the battlefield but also how caring for the returning troops and those affected on the home front changed how we care for each other in the community. We will also be touching on the Crimean War and WW2. Pupils will also be undertaking positive health promotion within their school. Working with the HOPE community project young people will be talking with residents of our local sheltered housing accommodation about their Masham memories. We will be using vintage advertising as a stimulus and working with an artist to encourage involvement.